Editorial Note: The following overview was prepared in advance of a meeting hosted by the West Health Institute with a diverse group of healthcare leaders to develop a national action plan which enables more seniors to safely go home after an emergency room visit, rather than be admitted to the hospital. Experts and seniors themselves say home-based care can be a more effective way to treat patients with certain diagnoses, while helping lower the costs of healthcare. The West Health Institute is continuing to work with Urgent Matters on alternatives to admission at the ED. Of the $2.9 trillion spent on healthcare in the U.S., inpatient medical care accounts for almost $1 trillion per year. Today, more than 80% of unscheduled hospital admissions originate in the Emergency Department (ED), while Emergency Physicians (EPs) comprise only four percent of the physician workforce. There is a growing appreciation that care initiated in the ED may too often trigger a subsequent “default” inpatient hospitalization, resulting in unnecessary cost and otherwise avoidable harm. The hazards of this scenario may be particularly pronounced in the aging adult population, where chronic disease is more prevalent and repeated hospitalizations increase the risk of delirium, nosocomial infections and falls. Presently, most EPs are generally afforded only three options following ED treatment: admit, discharge, or observe. However, early research suggests that the needs of older adults with multiple chronic conditions may be better met by providing more home-based care options. These options require innovations in technologies, policies and practices to better connect the ED with home-based skilled care as well as to physician oversight. The West Health Institute has formed a multidisciplinary external Advisory Council of leaders in healthcare to determine how best to amplify the appropriate use of emerging home-based care options for patients initially seen in the ED. Importantly, in addition to providing more efficient and effective alternatives to hospital-based care, developing more home-based options following ED evaluation could help establish infrastructure capable of better addressing a continuum of ongoing care needs, well beyond the timeframe immediately following ED treatment. The Gary and Mary West Health Institute (WHI) is dedicated to pioneering new and smarter technologies, policies, and practices to make high-quality healthcare more accessible at a lower cost to all Americans. Our focus is supporting and creating healthcare delivery models that enable seniors to successfully age on their own terms, preserving and protecting their dignity, quality of life, and independence. Our research has a particular emphasis on finding ways to provide better matched, more cost-effective care for the growing population of aging adults, many of whom suffer from multiple chronic conditions. Presently, most emergency physicians (EPs) are generally afforded only three options following ED treatment: admit, discharge, or observe. However, early research suggests that the needs of older adults with multiple chronic conditions may be better met by providing more home-based care options. These options, enabled through innovations in appropriate policies, practices, and technologies, could allow EPs to direct certain patients to better matched, lower cost home-based treatment when appropriate. In support of its overall mission, WHI has formed a multidisciplinary external Advisory Council (AC) of leaders in healthcare to determine how best to amplify the appropriate use of emerging home-based care options for patients initially seen in the ED. Preliminary discussions have already identified potential levers to increase this use of home-based care, including additional focused research, advocacy, communications, and education/training initiatives. Importantly, in addition to providing more efficient and effective alternatives to mismatched hospital-based care, developing more home-based options following ED evaluation could help establish infrastructure capable of addressing a continuum of ongoing care needs well beyond the timeframe immediately following ED treatment. Despite the generally limited options available to EPs, sufficient data are available to provide some preliminary estimates of the potential impact of ED-to-Home innovations. An initial WHI survey of the literature revealed those patterns of primary diagnoses and treatments most compatible with home-based care. The identified top six diagnoses, pneumonia, urinary tract infection (UTI), cellulitis, congestive heart failure (CHF), chronic obstructive pulmonary disease (COPD), and diabetes, were corroborated by WHI through preliminary research carried out in collaboration with the UCSD Department of Emergency Medicine. To explore the potential cost impact associated with home-based care for these diagnoses, WHI began by performing a survey of Medicare claims data from 2013. That survey revealed that there were 516,000 Medicare beneficiaries treated in the ED for pneumonia, of which 69% were admitted. Only 1200 of these pneumonia patients received an episode of Medicare Home Health (HH) directly following treatment in the ED. Following ED treatment, the average 30-day cost for the pneumonia patients that received inpatient care was $13,851, while the average 30-day cost for the pneumonia patients that received HH was $5,866. Similar differences in between Medicare inpatient and HH claims following ED-based care were obtained for CHF and UTI diagnoses. Of course, not all patients who received inpatient care for these conditions would have been candidates for home-based care alternatives, so the potential cost savings cannot be directly derived from the above 30-day costs. To better characterize the opportunity, WHI further collaborated with UCSD to query EPs on a patient-by-patient basis to build a profile of those patients EPs would consider to be candidates for home-based treatment options. Savings estimates attributable to home-based alternatives for each of these selected candidate patients were also obtained by building hypothetical Medicare HH bundles and comparing them with diagnosis-related group (DRG) payments for the actual hospital-based episodes of care. Generally, the DRG payments for the selected candidate patients were significantly lower than the 30-day averages over all admissions, as expected. Nevertheless, for Medicare beneficiaries, the average payment difference between the DRG and hypothetical HH payments was still significant at about $4,100 per episode of care. Based on the percentage of patients selected by EPs for home-based care, the total number of Medicare beneficiaries who could benefit from home-based care options was estimated to be at least one million patients, representing about 10 percent of the total number of Medicare hospital admissions arising from the ED. Combining this population with the estimated per-case savings provided a preliminary estimate of at least $4.1 billion in potential annual Medicare cost savings. WHI expects more accurate estimates of the total impact to emerge as the newly formed ED-to-Home AC engages more closely with collaborators, driving adoption and generating further evidence of the ED-to-Home care model benefits. Importantly, as intimated earlier, this total impact could be more significant than the immediate cost savings estimated above, due to additional benefits of home-based care such as limiting aging adults’ exposure to known risks of hospitalization and reducing readmission rates as community-based care infrastructure becomes more fully established. Many of the constitutive elements of home-based care are already available, both in demonstration projects and in clinical practice. 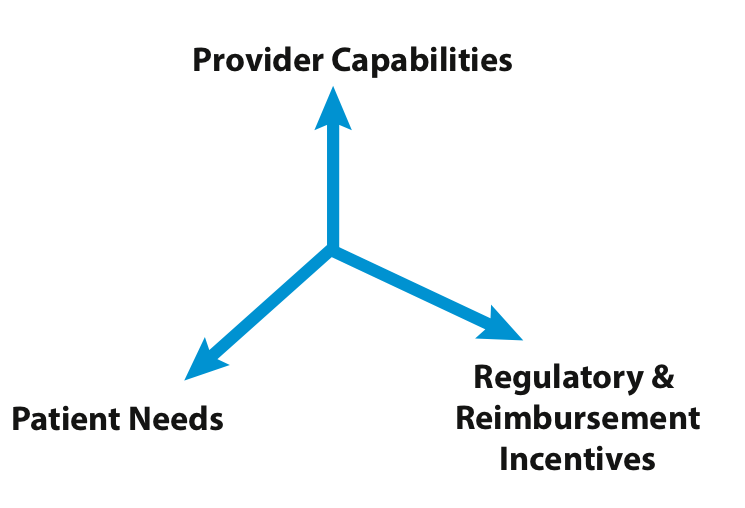 As shown in Figure 1, sustainable home-based care, both in its present state and in the future, exists within a nexus of provider capabilities, patient needs, and regulatory/reimbursement incentives. More recently, nonintegrated systems have embarked on demonstration projects based in part on the HaH model. A program led by Dr. Albert Siu at the Mount Sinai Icahn School of Medicine entitled Mobile Acute Care Team (MACT) has been sponsored by the Centers for Medicare and Medicaid Innovation (CMMI). The MACT team comprises physicians, nurse practitioners, registered nurses, social workers, community paramedics, care coaches, therapists, and home health aides, all of whom work together to provide interdisciplinary post-acute care services for 30 days after hospital admission. Home-Based Primary Care (HBPC) represents another grouping of care models. While not necessarily substitutive in nature, HBPC models still deploy significant home-based care resources, including in-home physicians, skilled nurses, and therapists. The VA system currently provides one of the most extensive implementations of a HBPC model under the direction of Dr. Thomas Edes.9 At the Cincinnati VA, patients treated in the home may be shifted from a Hospital-In-Home (HIH) model to HBPC once HIH is no longer necessary. Significant numbers of HBPC models are currently being studied as part of a demonstration program known as Independence at Home, sponsored by the Centers for Medicare and Medicaid Services (CMS). In one study, HBPC has been extensively deployed and studied at the MedStar Health System under the direction of Dr. Eric DeJong.10 Certain house calls programs, especially those that involve ongoing medical management of complex frail aging adult patients, may also be considered to be HBPC models. HBPC and ED-based geriatric care are linked in the GEDI WISE program under the direction of Dr. Lynne Richardson, also at Mount Sinai in New York City. In addition to HBPC, there is another grouping of care models that are generally designated as Home Health (HH), described earlier in the initial estimates of cost savings. In the U.S., most home-based care for the over-65 population is currently provided under the Medicare HH benefit, which requires there be both a skilled need (e.g., care requiring skills of an RN) and homebound status. Physician oversight is also required, both for the drafting of a care plan and for ongoing care during the HH episode. However, when compared to HaH and HBPC models, the level of physician oversight for HH cases is generally lower and does not usually include physician visits to the home. For older patients with lower levels of need, the continuum of home-based care includes models of care that are less intensive than HH including both intermittent home-based skilled care and informal family caregiving as well as community supports and services such as Meals-on-Wheels, Aging and Independent Services, and community volunteer services. It is important to acknowledge the intrinsic limitations of discrete model designations, given the fluidity in individual patient needs as they move throughout the continuum of care. For example, a frail chronically ill aging patient nominally cared for under a HBPC service model may effectively experience HaH levels of care during acute exacerbations of their chronic disease. Similarly, although HH agencies generally provide care evenly over a 60-day episode, the Medicare HH benefit does not preclude front-end loading of higher intensities and frequencies of skilled visits. When coupled with more physician engagement and oversight, such a Medicare HH episode of care could thus include services typically associated with HBPC or even HaH models. Of course to ramp up to such levels of care, HH providers may need to avail themselves of additional emerging community-based resources such as community paramedics (CPs). Such resources could enhance the ability of a HH agency to respond on short notice, especially to serve emergent needs arising from the ED. As described previously, an initial survey of the literature, together with preliminary research conducted by WHI, suggests that the inclusion criteria for home-based care are often based directly on patient needs. For example, the VA Cincinnati HIH program, led by Dr. Andy Grubbs, was initially designed to address the needs of CHF patients, with a desired outcome of reduced readmissions. The Hospitalist Outpatient Parenteral Antibiotic Therapy (HOPAT) program at the University of Missouri School of Medicine was designed to provide home-based treatment for cellulitis and community-acquired pneumonia (CAP).11 As mentioned above, based on WHI’s recent survey of EPs, the primary candidate diagnoses for home-based care options include UTIs, cellulitis, pneumonia, CHF, COPD, and diabetes, all of which meet the inclusion criteria for HaH programs. Frailty in conjunction with comorbid chronic conditions represent a grouping of diagnoses that have been included in the list of patient needs appropriate for HBPC models of care. In preliminary research conducted by WHI, behavioral health issues have also been mentioned by several EPs as diagnoses that are not always best managed in a short-term acute inpatient episode of care; however, at present there are few home-based alternatives for behavioral health in the HaH, HBPC, or HH continuum of care. It is important to note that diagnosis codes are not, intrinsically, indicators of the level of care needed, so it is not surprising that a range of care models, including HaH, HBPC, and HH, may be brought to bear in the treatment of similar diagnosis codes. An alternative perspective for determining which patients receive home-based care is home-based provider capabilities. Across the span of home-based services, capabilities-based patient cohorts include those requiring IV antibiotic therapy, O2 therapy, hydration/electrolyte therapy, nebulizer treatment, diuresis and follow up services such as physical and occupational therapy. Importantly, once a certain set of provider capabilities are successfully deployed, early evidence suggests that demand tends to result in an expansion of those capabilities. At the Cincinnati VA, for example, to meet patient needs, ED physicians began proactively asking for the HIH provider team to add complex wound care management to their initial capabilities. In response, HIH team members began obtaining credentials in wound care management and treating wounds in patients’ homes. The limitations in home-based care options can be attributed, in part, to a lack of incentives. Traditionally, there has been little motivation for hospitals or health systems to provide home-based alternatives for any patients who could be justifiably admitted to the hospital. The DRG payment structure incentivizes intermittent, hospital-based acute care, even for older adult patients suffering from ongoing chronic disease. More recently, the Affordable Care Act introduced readmission penalties that have provided a countervailing incentive, promoting more continuous management outside the hospital setting of certain diseases such as heart failure and pneumonia. Future planned Medicare reductions in per-case revenues over the next decade may further incentivize hospital-based health systems to adopt population health strategies. Today, higher intensity home-based care models such as HaH and HBPC are reimbursed only within integrated delivery systems such as the VA or Presbyterian Healthcare Services. However, certain components of these home-based models are covered within traditional Medicare Fee-for-Service benefits. As described earlier, skilled services including nursing and therapy care, are reimbursed under the Medicare HH benefit. Physician care, including home visits, are also reimbursed, but the Medicare Fee-for-Service benefit does not cover transportation and other overhead, so it is difficult to provide a seamless integration of physician and skilled nursing care. In summary, for the present, it remains difficult to assemble a continuous care delivery model out of a patchwork of specific Fee-for-Service benefits. Some elements of the Fee-for-Service patchwork have been acknowledged. CMS has recently introduced new codes for physician care coordination and care transitions management, for example, and there is consideration of relaxing the homebound status restriction on the HH benefit for particular cases. In certain geographical areas such as densely populated metropolitan areas, it has been possible for physicians to perform a sufficient number of home visits with limited travel and overhead. For example, the Mount Sinai Visiting Doctors Program has teamed with the Visiting Nurse Service of New York (VNSNY) to provide a dedicated and integrated team of nurses and physicians to care for patients in their homes. Telehealth, which could streamline the physician oversight of skilled care in the home, is not generally reimbursable in current Medicare Fee-for-Service. However, Medicare Advantage (MA) plans may soon opt to add telehealth, and telehealth is under consideration for newer generations of Accountable Care Organizations (ACOs). In early 2015, Health and Human Services (HHS) introduced aggressive goals for value-based payment in which payers (e.g., MA plans and HMOs) as well as providers (e.g., ACOs) will be incentivized to provide value over volume.12 Beyond simply addressing elements of the HH patchwork, such value-based payment initiatives could open the door for bundles of entire episodes of care such as HaH or HBPC. As indicated previously, pilot and demonstration projects are already under way that could provide the basis for such bundles of care – essentially both incentivizing and empowering providers to coordinate the individual pieces. It is important to acknowledge that the groupings of care under such bundles may be less prescriptive and structured than present-day groupings (e.g., the current prospective payments for the Medicare Home Health benefit). More broadly, with the emergence of value-based payment models, payers and providers may be forced to assume significantly more risk and to operate with considerably more autonomy. As a result, support in the form of mentorship, guidance, and community-based teaching will be needed, both to facilitate the development of clinical care models and to provide administrative support to recoup cost, manage risk, and ensure high-quality care. Despite the breadth and depth of home-based care options described in the previous section, few of these models are generally available options for EPs. 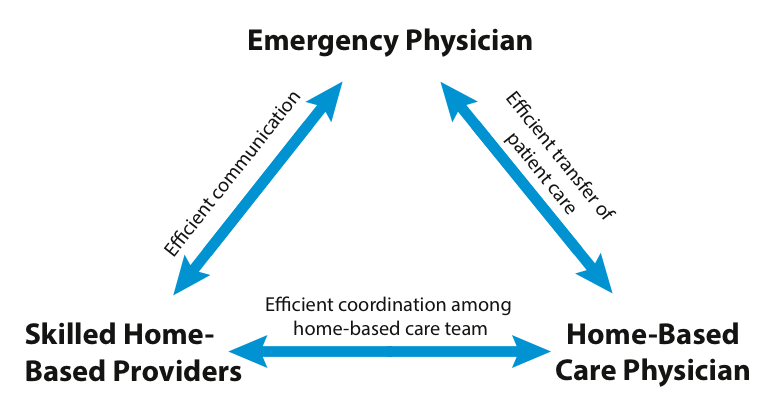 As shown in Figure 2, the ED node of care must be tightly connected to other nodes of home-based skilled care as well as to physician oversight. Specifically, as indicated by the arrows at the left of Figure 2, there must be an initial efficient line of communication between the ED physician and the home-based care provider to ensure that the home-based care team is appropriate for the patient. As indicated by the arrows on the right of Figure 2, there must also be an efficient “hand-off” mechanism so that the home-based care physician can assume medical custody of the patient. Finally, as indicated by the arrows at the bottom of Figure 2, there must be efficient and ongoing coordination between the overseeing home-based care physician and the skilled home-based care providers. Tight coordination between the nodes shown in Figure 2 clearly implies a level of medical interoperability that includes bidirectional data exchange. In addition to data exchange capabilities, other innovations necessary to enable smooth transitions from ED-to-Home include innovations in home-based durable medical equipment (DME). For example, infusion pumps may, in some cases, be replaced by elastomeric infusion balls to streamline the deployment of home-based care. Similarly, newer patient monitoring systems and Point-of-Care (POC) testing platforms may provide clinical laboratory data pertaining to patients treated in home-based care programs. It is important to note that the majority of ED visits do not happen during normal working hours. As such, the elements represented in Figure 2 may need to be deployable off hours, potentially requiring additional support resources, for example, Community Paramedics (CPs), either through stand-by response capabilities, or more directly, through an established affiliation with one or more of the entities shown in Figure 2. As described earlier, one of the ancillary benefits of establishing the ED-to-Home model is the creation of infrastructure capable of providing ongoing patient engagement beyond the particular episode of care that originated in the ED. In this context, CPs could also establish long-term relationships with patients and their families, facilitating care options to manage complex chronic disease in aging adults that extended beyond simply calling 911. Presently, innovative emergency medical services providers are already able to deliver elder home visits, perform home safety and wellness checks, and identify fall risks as well as provide fast response to calls for symptom management or concerns raised by family members who may not live in close proximity to patients. In order to realize the potential of the ED-to-Home opportunity, WHI recently embarked on a multicomponent impact plan. The first component involves WHI directly contributing to the body of evidence that suggests efficient transitions from ED to home are possible, efficient, effective and scalable. In addition to clarifying and elaborating the various clinical pathways, patient cohorts, and technology developments, the body of evidence will necessarily include identifying policy changes needed to realize the opportunity. While the evidence is recognized to be intrinsically diverse in nature, a common core of requirements may be gleaned from studying the exemplary cases. By advancing a consensus on common requirements, ED-to-Home innovators can facilitate adoption across the diversity of individual health systems, each acknowledged as having unique resources and constraints. WHI has also begun work in collaboration with the American College of Emergency Physicians (ACEP) and the Actuarial Research Corporation (ARC) to establish both baseline and adoption metrics in order to monitor the advancement of ED-to-Home innovations and to track concomitant cost savings. Finally, as described earlier, the WHI impact plan also includes the formation of a multidisciplinary AC. The AC is designed to recruit the best and most influential thought leaders capable of identifying and acting on opportunities to make a difference through a combination of research, advocacy, communications, and education/training initiatives. The AC will first convene in late August 2015 in order to reach consensus on short-, mid- and long-term actions that complement current efforts to reduce avoidable hospital admissions from the ED. The AC’s specific deliverables include developing a consensus on the value, methodologies, and desired outcomes of ED-to-Home innovations, as well as a general plan and commitment to more fully realize the benefits of home-based care in support of successful aging. 1. Hartmann M, Martin AB, Lassman D, Catman A, the National Health Expenditures Team, National Health Spending In 2013: Growth Slows, Remains In Step With The Overall Economy. Health Affairs. 2015; 34(1): 1-11. 2. Schuur JD, Venkatesh AK. The growing role of emergency departments in hospital admissions. The New England Journal of Medicine. 2012;367(5):391-393. 3. Kocher KE, Dimick JB, Nallamothu BK. Changes in the source of unscheduled hospitalizations in the United States. Medical Care. 2013;51(8):689-698. 4. Cryer L, Shannon, SB, Van Amsterdam M, Leff B. Costs For ‘Hospital At Home’ Patients Were 19 Percent Lower, With Equal Or Better Outcomes Compared To Similar Inpatients Health Affairs. 2012;31(6):1237-1243. 5. Leff B, Burton L, Mader SL, et al. Hospital at home: feasibility and outcomes of a program to provide hospital-level care at home for acutely ill older patients. Annals of Internal Medicine. 2005;143(11):798-808. 6. Leff B, Burton L, Mader S, et al. Satisfaction with hospital at home care. Journal of the American Geriatrics Society. 2006;54(9):1355-1363. 7. Leff B, Burton L, Mader SL, et al. Comparison of functional outcomes associated with hospital at home care and traditional acute hospital care. Journal of the American Geriatrics Society. 2009;57(2):273-278. 8. Siu AL, Spragens LH, Inouye SK, Morrison RS, Leff B. The ironic business case for chronic care in the acute care setting. Health Affairs. 2009;28(1):113-125. 10. De Jonge EK, Jamshed N, Gilden D, Kubisiak J, Bruce SR, and Taler, G. Effects of home-based primary care on Medicare costs in high-risk elders. Journal of the American Geriatrics Society. 2014;62:1825-1831. 11. Dall L, Peddicord T, Peterson S Simmons T, Dall T. Hospitalist treatment of CAP and cellulitis using objective criteria to select patients. Medscape. 2003. 12. Burwell SM. Setting value-based payment goals – HHS efforts to improve U.S. health care. New England Journal of Medicine. 2015; (372):897-899. Solely funded by philanthropists Gary and Mary West, West Health is dedicated to pioneering new and smarter technologies, policies and practices to make high-quality healthcare more accessible at a lower cost to all Americans. Our focus is supporting and creating healthcare delivery models that enable seniors to successfully age on their own terms, preserving and protecting their dignity, quality of life and independence. Headquartered in San Diego with an office in Washington, D.C., West Health includes the Gary and Mary West Health Institute, a nonprofit medical research organization and the nonprofit, nonpartisan Gary and Mary West Health Policy Center. For more information, visit westhealth.org and follow us @westhealth.